Athletics plays a major part in the Annual School Calendar of DPS Rohtak. Over a long period of time DPS Rohtak has a long list of State and National representatives and continues this success with our current athletes. Our coaches cover many diverse disciplines involved in athletics and training is given before and after the school. It is a policy to allow as many students as possible to participate and all assistance required during training is given by the school coaches. Badminton has become another popular game with many students. Training for this is given during stay back after school where they are trained to play competitively and to get expertise of the coaches. Our staff also work closely with them. Cricket is a very popular game in India. Students opting for this game should have a good stamina for running in between the wickets for bowling and fielding. 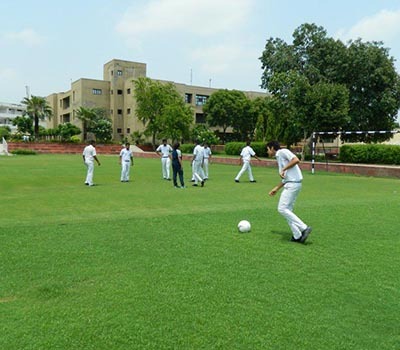 The school has a well maintained cricket field of international level and pitch for net practice. The cricket ground is name after a living legend, Sh. Rajinder Goel, who also happens to be one of our Trustees. The student desirous if learning this game stays back after the school for special coaching. Dipsites have participated at zonal and regional level in Inter School Competitions of CBSE as well as in State Board Schools. The renowned personalities who are associated with the game in our school are Sh. Rajinder Goel, Sh. Amit Mishra (Current International Player), Manoj Prabhakar (Ex International Player) and Yashpal Sharma (Ex International Player). Cross country has developed into a very strong and popular sport at DPS Rohtak. We have achieved success in inter school competitions and also participation by girls and boys from all levels throughout the year. This game involves large number of competitors running three or more kilometers. Best time for this is early morning on holidays. Children found this sport an enjoyable activity as many students socialize in a group running environment and to reach their athletic potential. Above all the bonus is, it helps them to keep fit. Basket Ball is a team where taller students get the advantage of playing the game well. Basket Ball is named after Michael Jordan, a renowned Basket Ball player. The students stay back after the school for special coaching from April onwards. Inter DPS Basket Ball tournaments for boys and girls are the most important and much rated tournament of the year. It is a team sport played at DPS Rohtak with great enthusiasm. This game has developed to involve many common techniques of shooting, passing and dribbling as well as player position and offensive and defensive structures. It was primarily an indoor sport now it is an outdoor sport in schools. The Basket Ball court is ideally situated in lush green surroundings and is a great spectator sport for the rest of the students. 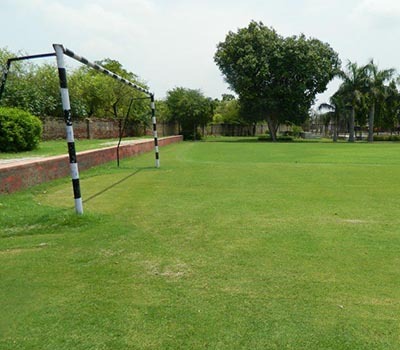 Football Ground of Delhi Public School Rohtak have crated many milestones in the game by setting immense standards for the game and for the young ones who aspires to be the next Ronaldo. The lush green football ground attracts not only the young ones but also the district authorities and they can’t get away by organizing tournaments of national and international levels. Parents support in this game and training commitments of the players have worked wonders with our football team. The school has an Olympics sized swimming pool which happens to be the centre of attraction for one and all. The school take some great measure is maintain the swimming pool and also to promote swimming among the students of Delhi Public School Rohtak by providing regular coaching embedded in the curriculum of the school and also after the school for the students who are interested. School recently has organized International CBSE School’s Aquatic Meet where a large number of Schools have participated from India and Abroad. The School has organized this mega event very conveniently and efficiently. The season commences from April to November. Training is also open to students wishing to improve their fitness but not necessarily compete. Parent supports is also taken during international meets for time keeping, judging and at inter house carnivals. Along with this the school has established a learner’s pool for the tinny torts to learn this far-fetched activity and to develop an additional talent. It is matter of great pleasure for us that the Government of India is now taking some deep measure for improving the game of hockey in our country. Hockey is our National Game but it does not have that hype what it should be having but not in the campus of Delhi Public School Rohtak as we have a well maintained hockey field in our campus and students of our school show a keen interest in playing this game. Volley Ball is a developing sport at Delhi Public School Rohtak. Recently, after the Olympics students have shown a keen interest in this game. Specialized coaching facility is given to students at nominal fees. The School has a very well maintained Volley Ball court and students make the most of it. It is a fast moving game and a craze with a large number of youngsters. The skating rink is very large and offers many students to practice there at any time. Our students have won laurels in skating at National and International level. Some parents, who are themselves experts in skating, guide and help the students with their expertise. Horse riding is a passion with Delhi Public School, Rohtak. There are many horses in the stable and new ones are added from time to time. There are well looked after by our supporting staff kept for this purpose and the vet visits & checks the horses from time to time. The students show their expertise on their horses during all main event held in school ground. Regular exercise with the horses is held after school for 5 days a week.